When Dodge released the Challenger SRT Hellcat for 2015, it catapulting the Challenger to king of the hill of every muscle car ever produced. 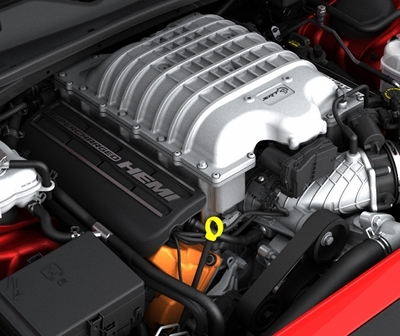 With a supercharged 6.2 liter Hemi V8 producing an incredible 707 horsepower and 650 lb-ft of torque, nothing in its class could touch its performance. The Challenger Hellcat became an instant legend and it’s future is secured as a highly collectable car. The Hellcat has so much power being transferred to its rear wheels that even with traction control activated, the Hellcat can’t obtain optimum traction to obtain an optimum quarter mile time for the power its engine produces. Burns Motors in Texas showed the true potential of a Hellcat by added a set of drag radial tires and 109 octane gas to a bone stock 2015 Challenger Hellcat and obtained a quarter mile time of 10.48 seconds at 133 mph. 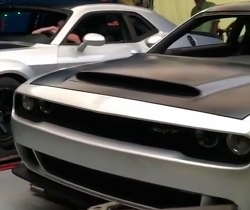 Dodge will be releasing a super version of its current Challenger Hellcat. It’s rumored to be called the Dodge Challenger SRT Demon. The Challenger Demon will use the Hellcat’s supercharged 6.2 liter Hemi V8 which will produce at least an estimated 750 horsepower or as high as 800 horsepower. 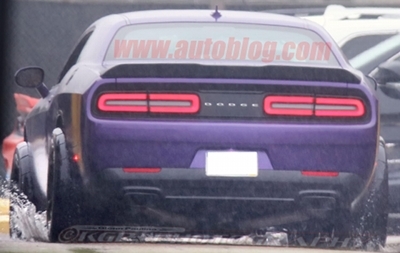 The good news is that the Challenger Hellcat will not be replaced by the Demon. The bad news is since the 2017 Challenger Hellcat has a base MSRP price of $62,495, expect that the Demon will cost around 20 percent more. This would put the Demon’s price at around $75,000. Even at this price it’s a unbelievable amount of horsepower for the money. The Demon’s exterior will take its styling cues from the Dodge Challenger GT AWD Concept which debuted at the 2015 SEMA show. Just like the Challenger GT AWD Concept, the Demon will have considerably wider 20-inch performance tires than any current Challenger model, so wide that they will need large fender flares in order to accommodate these massive tires. Wider tires serves two purposes. First, it will allow the Demon to substantially surpass the Hellcat’s handling with more rubber meeting the pavement. It’s possible that Dodge may make mild suspension mods along with the tire change which could have the Demon capable of 1 g on the skidpad. This is a big improvement over the Hellcat’s current .94 g skidpad. This would make the Demon just as good a handler as the best handling Mustangs and Camaros currently on the market. Second, the fatter tires will greatly improve off-the-line traction which should greatly improve the Demon’s quarter mile time over the Hellcat’s. There is also within the realm of possibility that Dodge may drop a big surprise by offering all-wheel drive just like it showcased with the Challenger GT AWD Concept, which was equipped with a juiced up 5.7 liter Hemi V8 sending power to all four wheels via a state-of-the-art AWD system. Current rumors dictate the Demon will only be available in rear-wheel drive. However if AWD is offered, the off-the-line traction benefits would give the Demon even quicker quarter mile times. What we do know is that rumors of the upcoming return of the Ford Mustang GT500 which was set to usurp the current Hellcat by offering more horsepower, was expected to give the king of the hill of muscle car title back to Ford. Unfortunately for Ford looks like Dodge with the upcoming release of the Demon will ensure that Dodge will hold on to that title. Where Dodge is making a big mistake is using the name “Demon”. Dodge used the Demon name on the fastback version of the Dart in 1971 and 1972, the name was a flop due to the controversy it created. Dodge renamed the Demon for 1973, the Dodge Dart Sport. Dodge should find a better name for what will be the most powerful muscle car ever produced – something like the Challenger Crusader, Challenger Tomcat, Challenger Pit Bull, or Challenger GTR. If Dodge’s intentions with using the “Demon” name are to take this new super Challenger into the realm of spiritual warfare, then a better name would be the Dodge Challenger St. Michael the Archangel.